Avocado Day Cream Moisturiser for Oily Skin Type. Avocado Day Crème Moisturiser for Oily Skin Types from Wildcrafted Herbal Products - Natural Skin Care Products That Take Care of Your Skin Naturally. Avocado Day Crème Moisturiser for Oily Skin is a rich blend of essential oils and pure natural butters to moisturise your skin without leaving it feeling heavy or greasy. Avocado Day Crème Moisturiser for Oily Skin. Formulated for Normal to Oily Skin types, Wildcrafted Avocado Day Crème contains a rich blend of Avocado, and Jojoba oils with Cocoa Butter. Although these oils are known for their powerful moisturising and humectant properties, they do not create a greasy or heavy feeling on the skin. Orange Blossom and Lemon provide refreshing, warming and clean notes. 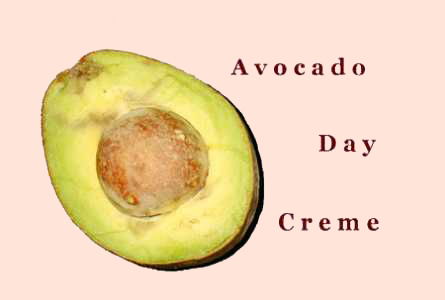 Wildcrafted Avocado Day Crème should be applied daily, after cleansing and toning for best results. Your skin will feel soft and smooth without any greasiness with Wildcrafted Avocado Day Crème.